As an intrepid emerging professional of the museum industry, I am all too familiar with the horror stories of being used as backfill or of being pressured into a crazy sense of overexertion that are prompted by the word ‘internship’. On the first day of my internship, I rolled myself out of bed at an ungodly hour in the middle of winter to get a tram to Melbourne’s Southern Cross Station to travel to Ballarat. I then caught a taxi to get to the Gold Museum. I thought that there was no way that any internship would ever be worth such hassle. I was instantly and irrevocably proven wrong. I worked on the exhibition Wonderful Things, which celebrates the Gold Museum’s 40th anniversary. Not only have I been shown the ropes of the curatorial process, but under the assuring guidance of curator Snjez Cosic, I have actually put pen to paper (or in this case, pencil – no pens in the storeroom, c’mon guys) and had a go! Objects lists, object labels, measuring and photographing catalogue numbers galore and more Microsoft Word tables than I thought possible, perhaps dull for some, but as a student desperate to develop skills, every day felt like Christmas. Working with the Gold Museum’s collection has been more fun than I could have ever possibly anticipated. Don’t let the name fool you, the Gold Museum has it all! Shark-teeth swords from the Pacific, a tortoise skull, Chinese textiles, garter guns, 200 year old dresses and weird bits of hair in frames, you name it, the Gold Museum probably has it – and it’s all coming out for the Wonderful Things exhibition. As an intern, helping on this project was a goldmine. The range of practical skills and experiences gained from working across such a diverse collection are priceless. I honed my ability to research objects, spending hours trawling online for like pieces, and was given a voice to tell the stories of this unique collection. Through the objects, I was able to interpret some of the incredible histories of the region and the people who have called it home (even sticking to the word limit… mostly). In an office of supportive mentors, I was exposed to the workings of a regional museum; questions were always welcomed and answered generously and I was made to feel part of the team. I am incredibly thankful to Michelle Smith, Snjez Cosic and Liz Marsden for welcoming me into their golden little world and strengthening my passion for this industry. Our latest exhibition, ‘A Victorian Silhouette’, features original 19th century garments and accessories alongside reproductions created by Sovereign Hill’s Costume Department. 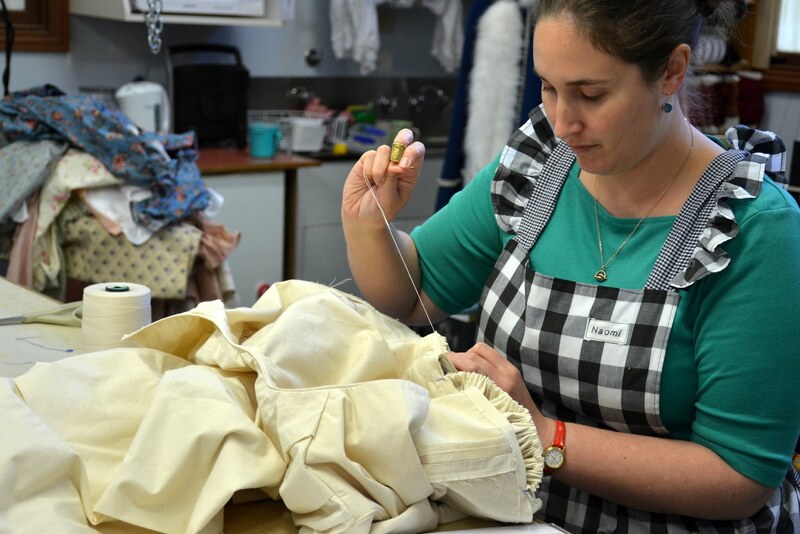 Production Assistant Megan Anderson writes about the process of creating a replica prototype (toile) using an original 1840s dress from the Gold Museum collection. The starting point in creating a replica is to study the existing garment as closely as possible. We were lucky enough to explore and measure every part of the original dress to assist in the process. 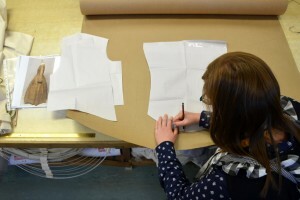 We began by looking at the fabric it is constructed from – simple polished cotton. In the 19th century, this fabric was commonly seen as lining for the inside of a garment. 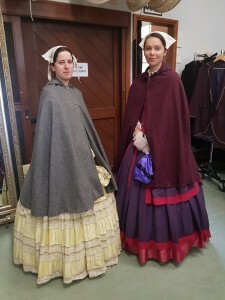 Museum collections often carry the finest examples of 19th century clothing, the garments that may have been special and therefore worn less often. This dress is an example of everyday wear; with elements that suggest it was worn by a working woman. The cloth is roughly woven with several flaws in the weave, which indicate that it was purchased inexpensively. The dull fawn colour typically seen on the inside of a garment is void of any pattern or print. The only decoration present on this garment is the lace around the neckline, which also suggests this dress needed to be practical and economical. The fabric alone provides a clue as to who may have owned or worn this garment. 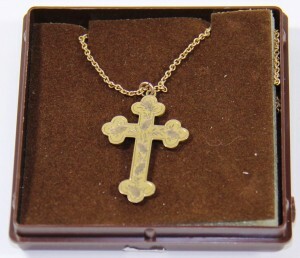 Although kept in excellent condition, there are other indicators that suggest it belonged to a working woman. It has been crudely constructed (either in haste or by an inexperienced hand), with all stitching carried out by hand and roughly altered for the final wearer. These poor alterations suggest that the dress may not have been made specifically for a specific person but modified to achieve a better fit. Whilst drafting a pattern for the replica toile, it also became clear that the creator of the original dress was either inexperienced or constrained by time. Many of the measurements were not equal on both sides of the pattern where it should be mirrored. Everything about it is unrefined and simple. While creating the replica, it became evident that implementing historical techniques would be necessary in order to achieve the desired outcome. The most relevant of these is gauging, which produces a superior micro pleat at the top of the skirt. The effect of gauging versus gathering for instance is precise evenly spaced pleating which was common during the 19th century. Skirts may have up to three rows of a gauging stitch. 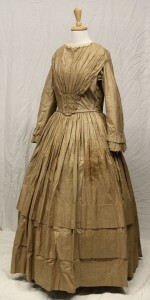 The original dress and replica only have one row, this again may demonstrate that time and economy were essential in the construction of the original garment. See the finished replica dress in A Victorian Silhouette, open until 4 November. As Manager and Senior Curator of the Gold Museum, my chief joy is the extraordinary collection with which I am privileged to work with. The collection, owned and managed by the Sovereign Hill Museums Association, has so many strengths that it is sometimes hard to know where to start. Most days, since coming to work for the Gold Museum, I pass by a large crate containing the head of the Chinese dragon, our Ballarat Loong. A stroll through the Gold Museum collection store involves walking past, under, or around, huge multi-hued Chinese temple boards. A watchful Chinese guardian Lion, perched on a high shelf, has observed many changes in the store; I am sure he was pleased when the organisation employed its first ever Collections Manager three years ago. 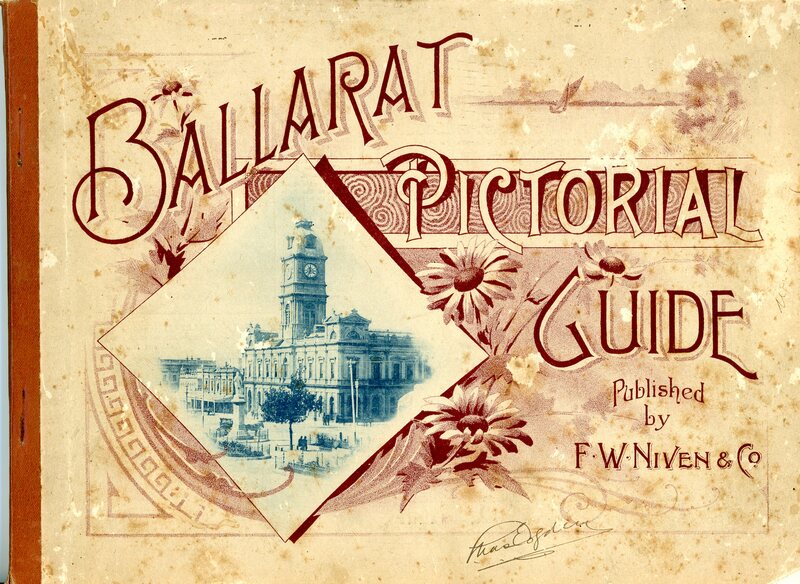 Ballarat is now one of only four known sites where a Qing Dynasty (1644-1911) dragon survives in whole or part. 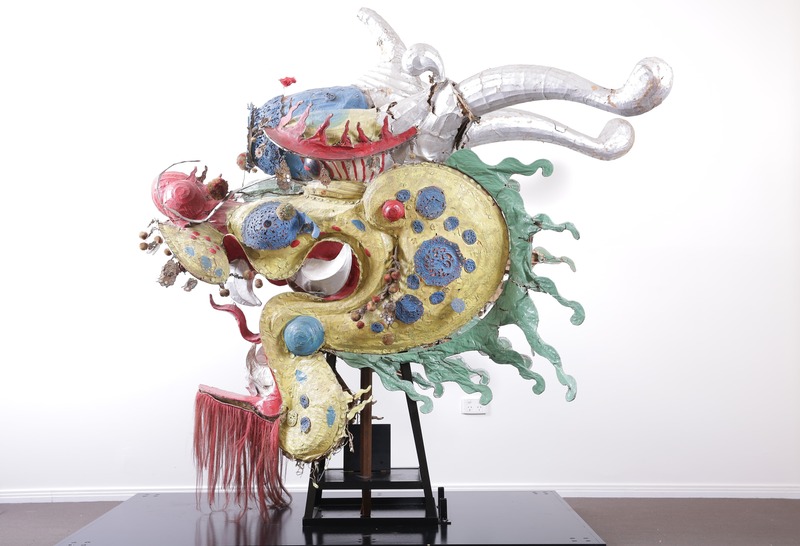 The processional assemblage, featuring Loong and the Lion, is designated a priority for conservation treatment. 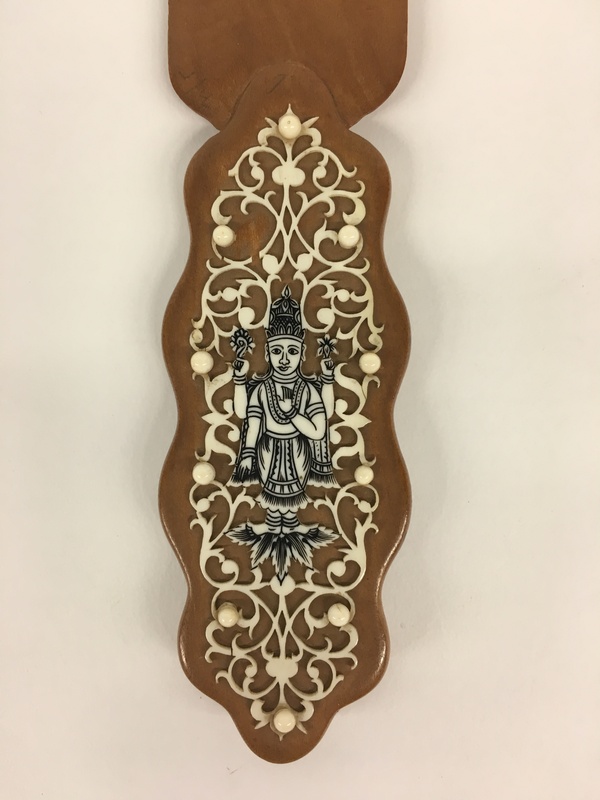 Unfortunately conservation can be a lengthy and expensive process, especially when working with objects as significant and complex as the processional assemblage. We could have made a decision to seek the necessary funds, undertaken the appropriate conservation work, and then created an exhibition, a process that might have taken years. Instead we decided that the collection had already been in store too long. 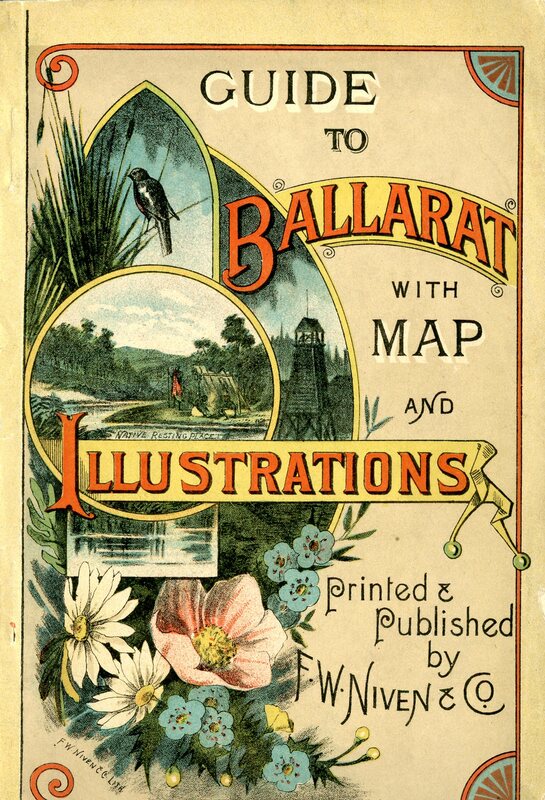 This was an important Ballarat Chinese story, in fact simply an important Ballarat story; and a story that needed to be told sooner rather than later. After all, this was a story 120 years in the making. 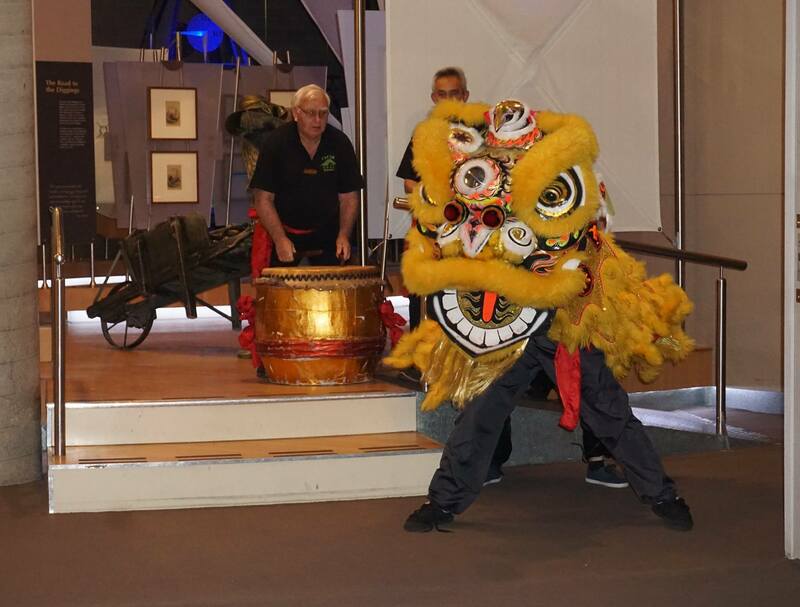 And so on 4 October, 2017 the Gold Museum opened Re-Awakening the Dragon, an exhibition focusing on this internationally significant Chinese Processional Assemblage, as well as an array of temple boards and material from the Main Road Chinese temple and its Ballarat predecessors including Golden Point. 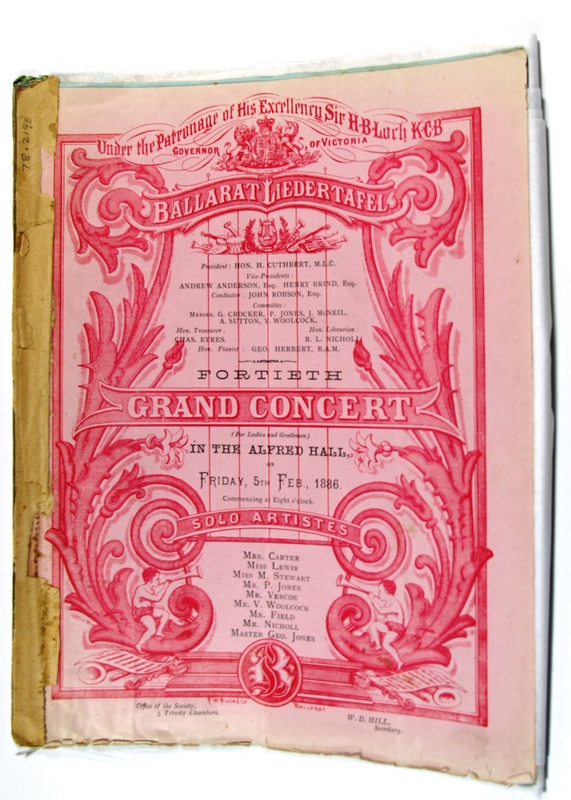 In presenting the exhibition, we hoped that the Ballarat community would be as excited about these objects as we were, providing a launch point for the necessary fund-raising. With the exhibition now open, the Awaken the Dragon Appeal is now in full swing, emulating the work of the Ballarat Chinese community some 120 years ago when they carried out their own fundraising campaign to purchase the processional assemblage in readiness for Queen Victoria’s 1897 Diamond Jubilee celebrations. 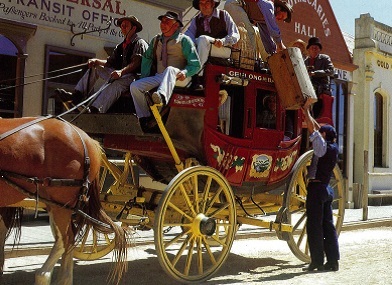 The Sovereign Hill Museums Association’s collection has been greatly enriched by the generosity of donors and supporters since it was founded in 1970. To support this important conservation and preservation work, we are asking you to consider donating to the Awaken the Dragon Appeal. Every donation over $2.00 is tax deductive and will be placed in a special account created for Awaken the Dragon Appeal. If you share our passion for history and collections, please consider donating to assist us in caring for these rare and precious objects. 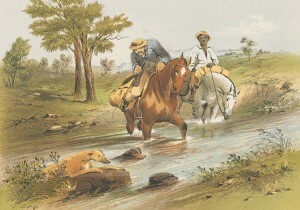 Until the 1850s, most of the horse-drawn vehicles available to Victorians were either English imports, or locally built and based on English designs. In the English tradition of coachbuilding each wheel, undercarriage and carriage body was made specifically for a single vehicle. As a result, there was great variety amongst vehicles belonging to the same family; no two buggies, wagons or dog-carts looked exactly alike. This method contrasted remarkably with the American coachbuilding tradition, introduced to the goldfields in the late 1850s. American firms, such as the Abbott-Downing Company of Concord (New Hampshire) relied on mass-produced ready-made components, guaranteeing consistency between vehicles. American vehicles were also visibly different to the typically squarish, box-shaped English designs which were practical for manicured country lawns – but not the unkempt roads to the Victorian goldfields. Primed for long-distance travel on difficult terrain, American-built coaches like the Concord ‘Jack’ incorporated leather thorough braces to ensure passenger comfort and to prevent the coach tipping over. Originally purchased as imports by Cobb and Co., American coaches quickly garnered favour with travellers for their comfort and reliability. 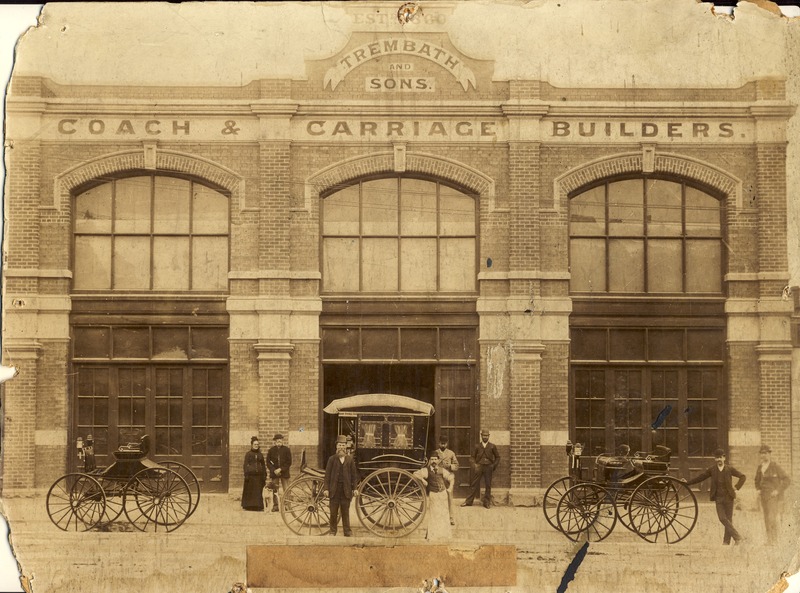 It wasn’t long before Ballarat firms, including Robert Watson and William Proctor, started constructing American-style vehicles – both for Cobb & Co. and for private use. Although American coaches became extremely popular for long-distance travel, local firms continued to build English and European-style vehicles. 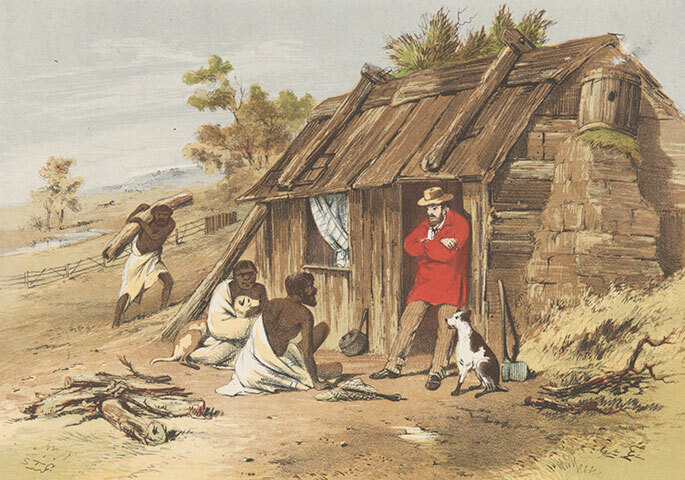 Goldfields residents also continued to commission and purchase them for commercial, working and private purposes. As the nineteenth century progressed, horse-drawn vehicles began exhibiting design influences from both the English and American coachbuilding traditions. 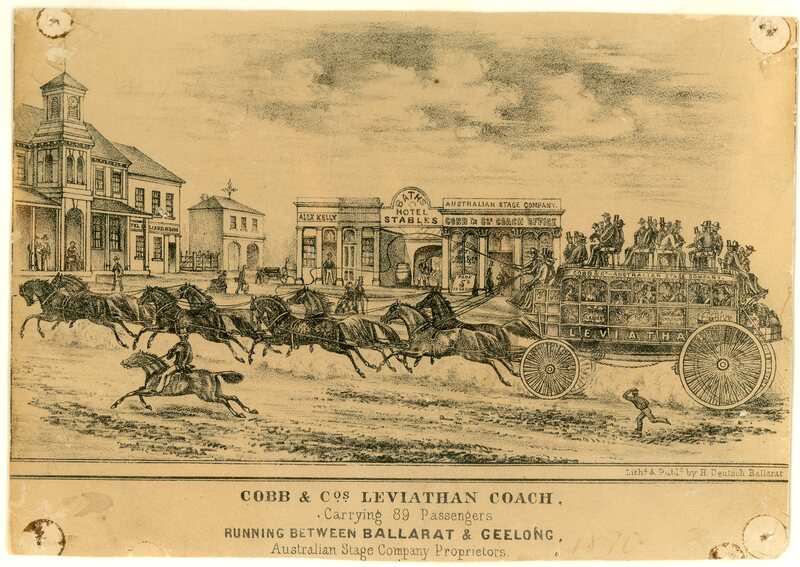 This is particularly evident in the variety of ‘buggies’ made and used in Ballarat during the 1850s. Across Australia, buggies were initially constructed according to the two-wheeled English design. By the 1860s, coachbuilders were also building four-wheeled buggies (as was common in America) but maintaining a dashboard, upholstered seating and varying types of boot – all elements used by English coachbuilders. 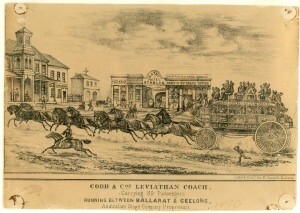 Throughout the latter half of the nineteenth century, new vehicle designs continued to emerge from England and Europe, and the goldfields became a melting pot of horse-drawn vehicles from across the globe. Deakin University student Michelle Derrick writes about her recent internship at the Gold Museum. As part of the Victorian Chamber of Commerce and Industry (VCCI) internship program, I was fortunate to take part in a paid collections and curatorial internship at the Gold Museum. For two days per week over eight weeks, I worked within two main project areas: collections management and exhibitions. With guidance from the Museum’s Collections Manager, Liz Marsden, I audited and re-housed objects from the Arnott-Rogers collection. George Arnott and Robina Rogers were missionaries in Sichuan, China during the late 1900s. 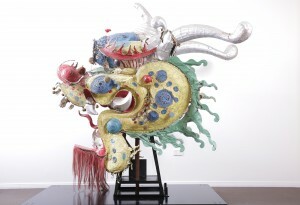 The couple collected Chinese artwork, textiles and household objects. It is a large collection comprising ceramics, paper, photographs, metals and textiles. I must admit, when I first saw the number of cabinets with boxes full of objects I was a little daunted! 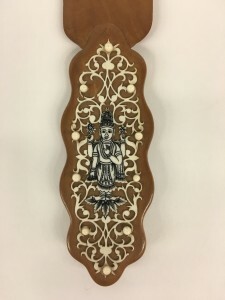 This soon gave way to pure enjoyment as I began opening boxes and carefully unwrapping the beautiful objects within, never knowing what I would find next. Many a photograph was taken for the Museum’s social media so we could share collection highlights! For each object I assessed its condition, updated and enriched the database record, threw away old tissue paper and attached a new label. As an alternative to layering objects on top of one another in boxes, we made partitioned trays from corrugated blue/grey board to allow for easier identification and retrieval of objects in the future. 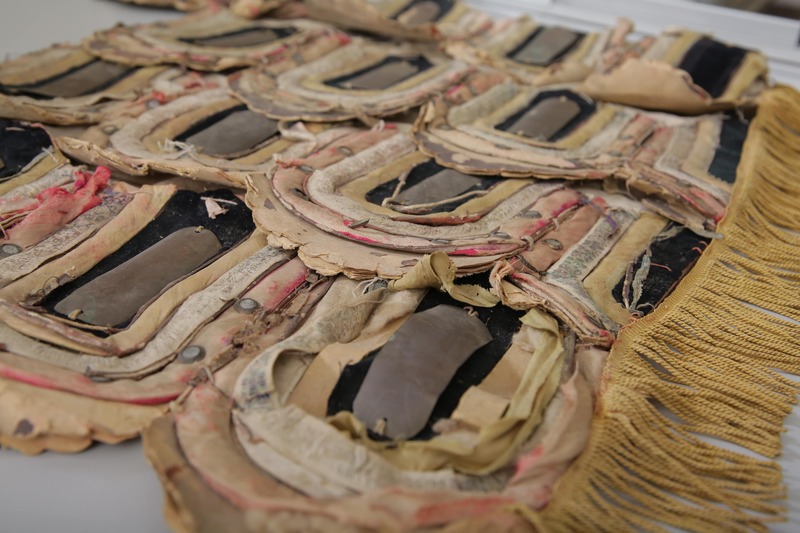 The Arnott-Rogers project highlighted the challenges of balancing the best methods of preventive conservation and storage, with limited resources and space. As a mentor, Liz taught me the importance of resourcefulness and how a little imagination goes a long way towards overcoming these challenges. I was also involved in preparations for the Museum’s exhibition Re-Awakening the Dragon, which showcases the Museum’s 19th century Chinese processional and temple collections. I assisted with the conservation cleaning of wooden carvings and ceremonial items, including Loong, one of Australia’s oldest Chinese processional dragon heads. 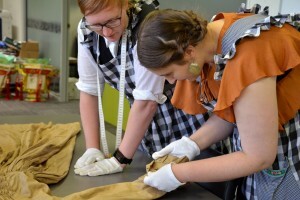 Other tasks included meticulously untangling tassels on processional textiles, dressing mannequins and assisting with the display of items in the gallery. 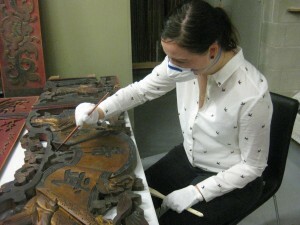 This project taught me valuable conservation cleaning techniques and preventive conservation for objects and textiles on display. In addition to hands-on learning, we had the opportunity to observe one of the Museum’s monthly acquisitions meetings. This gave real world insight into the processes and considerations involved in assessing objects for acquisition. Throughout the internship, we had the opportunity to ask questions and engage with Museum staff, and for that I thank Senior Curator Michelle Smith, Curator Snjez Cosic and Collections Manager Liz Marsden, for sharing their experiences and offering us valuable advice. Overall, this internship has been an invaluable experience. Through hands-on participation, observation and opportunities for discussion, I have gained valuable insight and experience in collections management, exhibitions and preventive conservation. A big thank you to VCCI and Deakin University for supporting this internship. Opportunities for paid internships in the museum industry are few and far between, which makes this initiative all the more important. Written by Michelle Derrick, Graduate Certificate of Museum Studies student at Deakin University. Interning at the Gold Museum has been an inspiring experience. It has enabled me to use what I have learnt at university in a practical work environment. It is fascinating to research the history behind a Miner’s Right as it gains a story that otherwise may remain untouched. 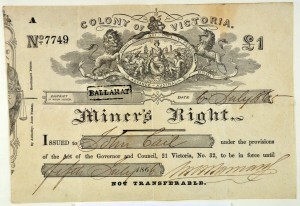 Since 1855, the Victorian government has managed gold prospecting through a licensing system known as the Miner’s Right. 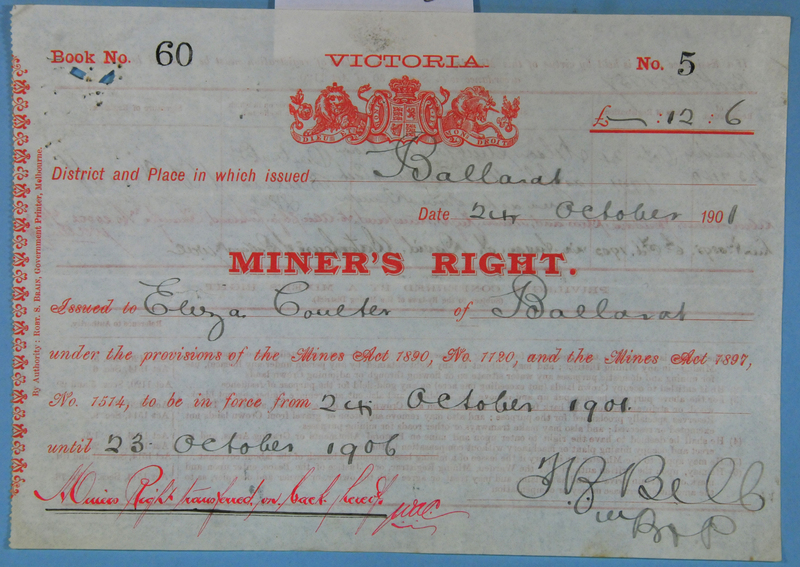 These certificates grant prospectors permission to search for gold in Victoria. The Gold Museum holds over 300 Miner’s Rights which is the largest collection in the state. 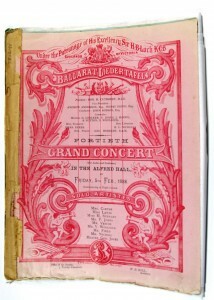 This collection has been recognised as significant by the Victorian Heritage Register. There were challenges with researching this collection. Information on miners is not always found or it is hard to distinguish between people that have the potential to connect to the right. One piece of information can begin to uncover the story of the rights and its owner. 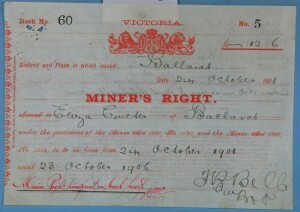 The Public Records Office of Victoria and Trove have been useful in discovering information about the miners behind the certificates. 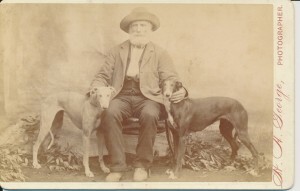 Theophilus Williams came to Australia from Bristol, England. 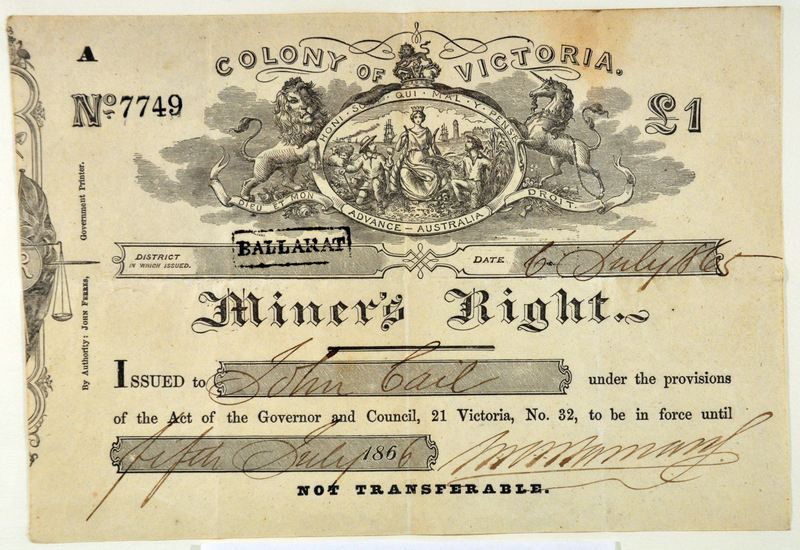 Theophilius was the director of various mining companies and went on to become the Mayor of Ballarat East. He managed both the ‘Great Redan Extended Company’ and the Llanberris Company, 1865 and 1872 respectively. 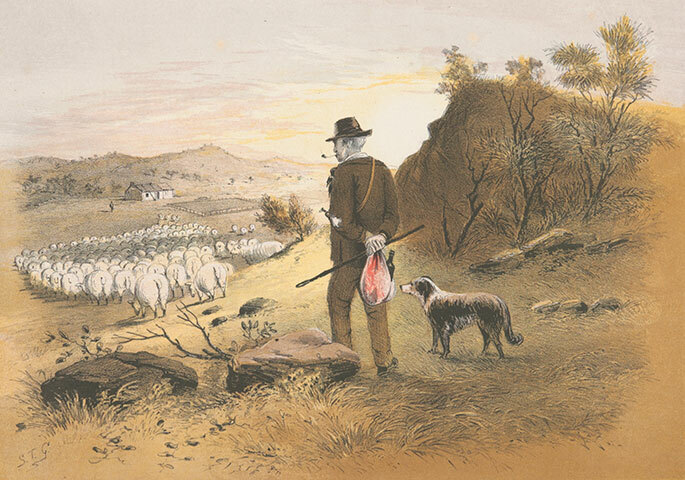 The story of Theophilus Williams and Andrew Cant highlight the importance of researching the Miner’s Right collection; otherwise these stories may have become lost in history. Written by Lucy Hughes, Bachelor of Arts (History) student at Deakin University. I was fortunate enough to be given the opportunity to intern at the Gold Museum for two weeks. I was given the task of helping research the Britt family collection. 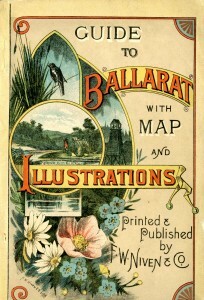 John and Mary Britt migrated from Ireland to Ballarat in the 1860s. They became farmers in Dunnstown after purchasing 10 acres for £10 in 1861. That land has stayed within the family ever since. It was interesting to discover that even today the land is now the location of the Inglenook Dairy, which is a major independent dairy brand. Even more amazing is the fact that the Britt family now has around 1,000 living descendants, with many living in the Ballarat region. John and Mary went on to have seven children, however it was Edmond, Cornelius and John that survived. 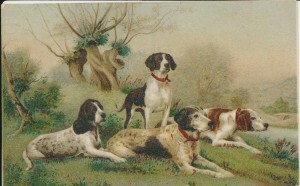 Each of them went on to have their own families, with most of them continuing the farming tradition. Although during my time I wasn’t able to identify everyone I’d hoped to, the ones I have been able to seem to have interesting stories of their own. 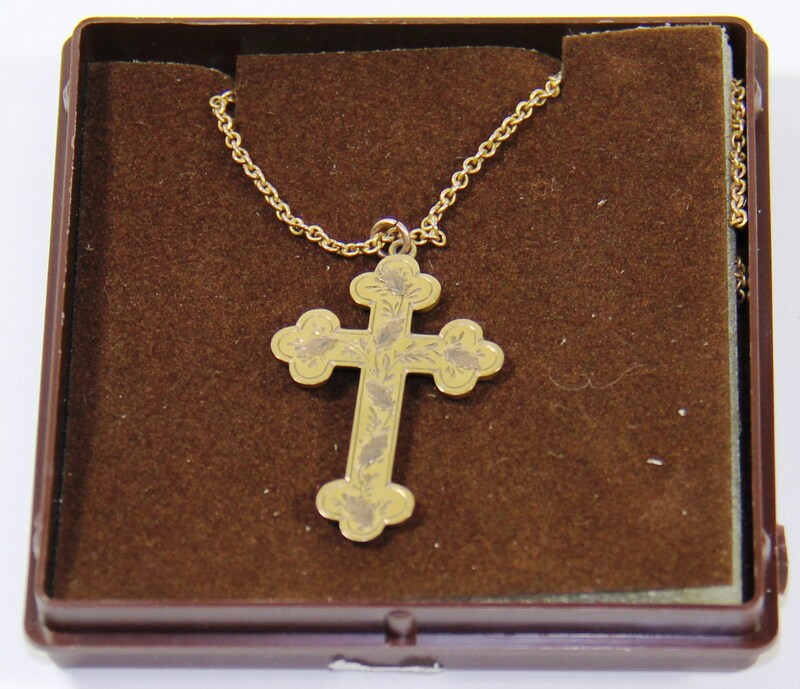 The collection also includes jewellery belonging to family members we were able to identify in historical photographs at the Gold Museum. It was an interesting experience investigating the jewellery’s brands and patterns to find their own story. Although it was a struggle trying to recognise vintage watch brands, I enjoyed the sleuthing I had to do. 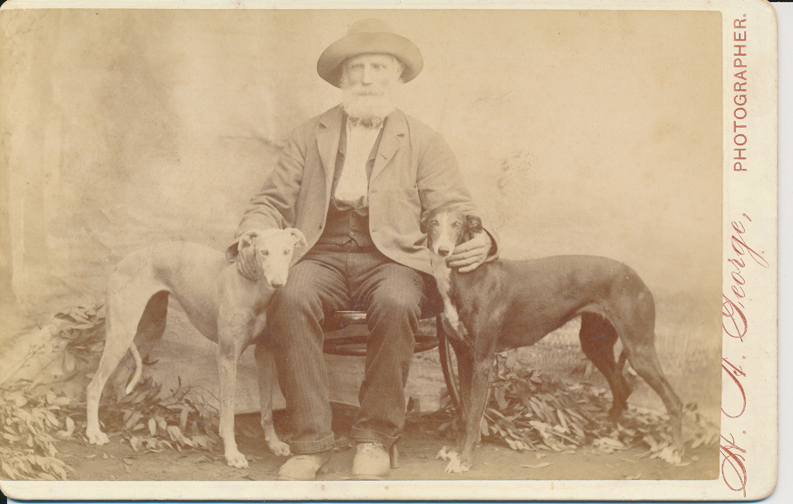 Using Trove and the State Library of Victoria helped place a time-frame on when things possibly occurred. I also got to try my hand at transcribing some of the postcards that belonged to the family. One difficulty was figuring out who sent the cards to whom, as many of the family members had the same name. This whole experience has been amazing. As an undergraduate student it is difficult getting opportunities like this. 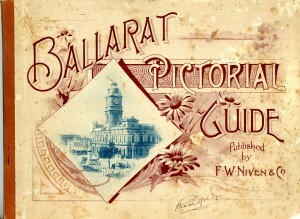 I’m looking forward to seeing more Ballarat stories at the museum in the future. The story of the Britt family and their collection will appear in the newly updated Gold Pavilion at the end of 2017. Written by Charlotte Ford, Bachelor of Arts (Japanese and History) student at Federation University. 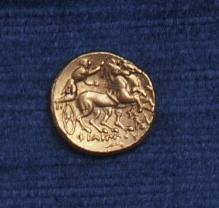 Gold Museum’s stater coin from Ancient Greece. The Gold Museum has a collection of ancient coins from Greece and Rome collected by Ballarat philanthropist Paul Simon. One item from this collection includes the Greek stater coin from 359-336BC. 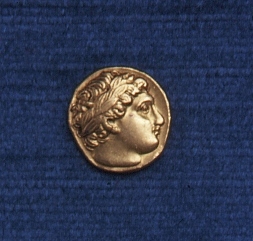 Philip II of Macedon appears on this coin. Young and ambitious, Phillip financed his conquest of nearby states by producing coins, called staters, made from gold captured from neighbouring mines. Phillip was able to conquer his neighbours with a well-trained army and an abundant supply of gold coins. The size, shape and design of modern Western coins has its origins in Ancient Greece. The Greek empire extended from around the Black Sea, North Africa, Italy, France and Spain. Ancient Greece was made up of small city states, where trading become essential. As a result, a currency system was developed. The stater coin and other historical currency from the Simon collection is currently on display in our Paul & Jessica Simon Gold Pavilion.